As a student or beginner artist, you don't have to spend a lot of money buying each different color pencil, which can become expensive. Although many different Prismacolor colored pencils are available, sometimes you will want to create a hue (color) that is not available. You can use the basic primary colors red, blue and yellow to make many varying hues. By adjusting the pressure you put on the colored Prismacolor pencil, you can create many different shades of a single hue. Color the picture or image with a dark Prismacolor pencil. Use long strokes when coloring. This eliminates broken lines and will make blending easier. Use a lighter pencil and color on top of the darker Prismacolor pencil to change the dark color to the color of your choice. Create light and dark shadows by alternating dark and light colored pencils to make different hues. Color the picture or image using a light Prismacolor pencil as the base color. Use a dark color over the top of the light color using a darker Prismacolor pencil. Adjust the pressure you put on the pencil to create a color variation of your new color. Heavier coloring will darken the picture or image faster. Lighter pressure will change the color gradually. 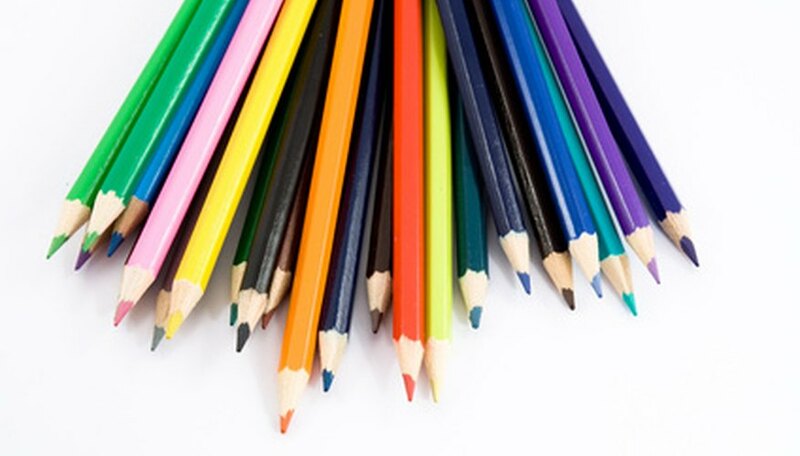 Create different colors and variations using different pencils. Create a secondary color using primary-color pencils. Color the picture or image using a primary color -- red, blue or yellow. Color the top of your original primary color using another primary color. This will create the secondary colors orange, violet (purple) and green. Color the picture or image using differing color variations of both primary and secondary colors. Color the image or picture using tertiary colors. Create the secondary colors orange, violet and green using the primary colors red, blue and yellow. Add the primary Prismacolor pencils together with the secondary colors to make the tertiary colors yellow-green, yellow-orange, red-orange, red-violet, blue-green and blue-violet. Color your entire picture or image using primary, secondary and tertiary colors. Vary the color by pressing harder to make bolder or darker colors or lighter pastel colors by putting less pressure when coloring with the Prismacolor pencil. Use a color wheel to identify the different colors and their complementary colors. Complementary colors are colors opposite each other on the color wheel. Use a cotton-tipped swab or cotton ball to blend the edges of the colors to create a seamless picture or image. Use white, black or gray pencil to create lighter, darker or murkier colors. Red plus blue makes violet (purple). Red plus yellow makes orange. Blue plus yellow makes green. Green plus yellow makes yellow-green. Green plus blue makes blue-green. Orange plus yellow makes yellow-orange. Orange plus red makes red-orange. Violet plus red makes red-violet. Violet plus blue makes blue-violet.